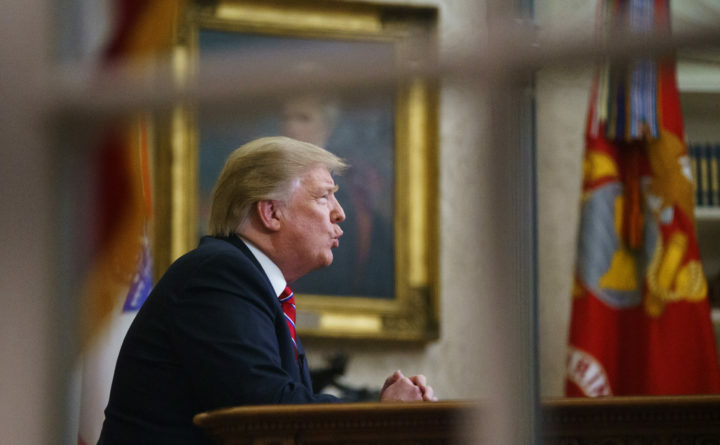 President Donald Trump gives a prime-time address about border security at the White House in Washington. A group of federal employees working without pay during the partial government shutdown have likened their predicament to involuntary servitude in a lawsuit filed last week, accusing President Donald Trump and their bosses of violating the 13th Amendment. The lawsuit marks at least the third pursued by federal workers against the Trump administration as the government shutdown enters its 23rd day, the longest in history, leaving hundreds of thousands of employees without a paycheck and, in many cases, struggling to pay bills. Agents with U.S. Customs and Border Protection and workers for the Bureau of Prisons have already filed lawsuits against the administration through their respective unions. But this case, filed Wednesday in the United States District Court for the District of Columbia, diverges from the others by invoking the 13th Amendment, which abolished slavery and involuntary servitude in the aftermath of the Civil War. The four plaintiffs, who are from Texas and West Virginia, work for the departments of Justice, Agriculture and Transportation; one is an air traffic controller. The lawsuit also claims violations of the Fair Labor Standards Act, among other statutes. According to the lawsuit, if the employees don’t report to work, they could face discipline or removal. The suit claims that this amounts to a form of coercion barred by the 13th Amendment. For example, the Supreme Court held in 1988 that pushing mentally disabled men to work on a farm for no wages by threat of institutionalization did not amount to involuntary servitude, because “psychological coercion” isn’t covered under the amendment. For similar reasons, circuit courts have held that threatening unpaid or underpaid migrant workers with deportation is not involuntary servitude. Kids forced to complete mandatory community service as a condition of graduation also isn’t involuntary servitude, as many disgruntled parents have tried to argue in court. And forcing an impoverished man who couldn’t afford a $3 tax to perform compulsory road work as an alternative is also not involuntary servitude, the Supreme Court ruled in 1916. That case, Butler v. Perry , is the “closest case to the government forcing somebody to work and being the defendant in a 13th Amendment case,” LeRoy said. But Butler was a private citizen threatened with imprisonment for not working,whereas the government has the authority to call in employees to work without pay under the Antideficiency Act, which prohibits the executive branch from spending money Congress hasn’t yet appropriated — including wages. The problem with the law, as Todd Dickey, an assistant professor at Syracuse University pointed out in a commentary for The Washington Post, is that it runs contrary to the Fair Labor Standards Act, which lays out minimum-wage requirements for government employees. That’s an argument federal employees have made successfully in the past. As for an involuntary servitude argument, LeRoy said there isn’t a precedent for the situation the federal employees have presented. At the same time, he said, a government shutdown has also never lasted this long, putting these federal employees in uncharted legal territory. Congress passed legislation on Friday ensuring furloughed workers will receive back pay once the government reopens, which would still need to be signed by Trump. Kator argues that this won’t make a difference to the employees’ 13th Amendment claims, because “the bottom line remains that federal employees are being compelled to work without pay for an indefinite period of time,” he said. And there’s no telling how long that situation may last, with a deal for Trump’s border wall nowhere in sight. If Democrats don’t give in to Trump’s demands to pass legislation including $5.7 million in border wall funds, the president has threatened to declare a national emergency to build the wall. On Sunday, Sen. Lindsey Graham, R-South Carolina, urged Trump to reopen the government and continue negotiating with Democrats, and only resort to a national emergency if no progress is made. If the shutdown ends in the immediate future, LeRoy said, the promise to pay back the workers would weaken their case. But if the shutdown lasts “months or years,” as Trump has said is possible, then “what this begins to look like is a form of indentured servitude,” LeRoy said, referring to the 18th century mechanism by which servants worked for masters for a period of time without pay, but were paid much later at the end of their service.